1. A reconstruction of the bolide impact proposed to have caused the mass extinctions of the non-avian dinosaurs among other organismal groups. The impact crater is 180 kilometers in diameter and the bolide was likely at least 10 kilometers in diameter. Courtesy of Gerta Keller. 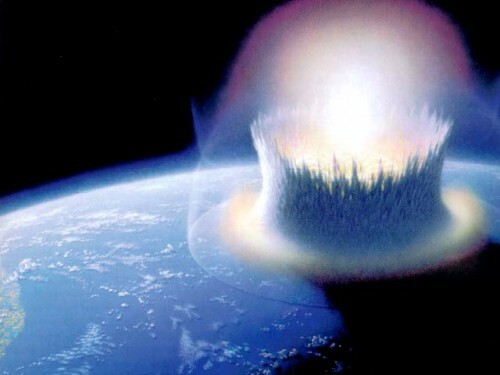 A meteor which crashed into the Earth long ago is thought to have wiped the dinosaurs off the face of the planet. This hypothesis was first proposed in 1980, when Luis Alvarez and a team of scientists discovered a thin sedimentary layer containing a high concentration of iridium between rocks of the Cretaceous and Paleogene Periods. This boundary, often termed the K-T or K-Pg boundary, marks the extinction of the dinosaurs and the beginning of the “Age of Mammals” about 65.5 million years ago. Since iridium is extremely rare on Earth, it was inferred that the high concentration of iridium came from a meteor which collided with the Earth, forming the 180-kilometer-wide Chicxulub crater on the Yucatan Peninsula. However, new evidence may suggest otherwise, and some researchers now believe that volcanism in India may have been involved in driving the mass extinctions. 2. The Deccan Traps of India, solid remains of the mega-eruptions which occurred between 67.5 and 65 million years ago. The lava flows may have spread over 1500 kilometers and are thought to have caused the mass extinction of over 50 percent of global species. Courtesy of Gerta Keller. 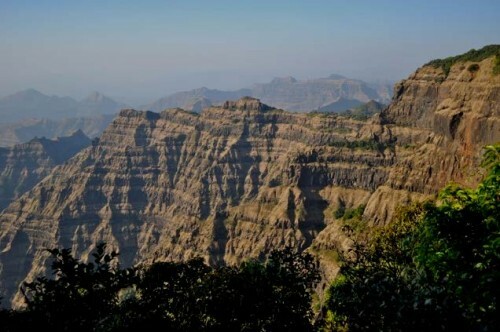 Dr. Gerta Keller at Princeton University has been studying a 65-million-year-old Indian volcanic event known as the Deccan Traps for quite a while. Although she does not question whether there was an impact near the end of the Cretaceous Period, she is unconvinced that it occurred at the K-T boundary and caused the mass extinctions. Keller looked at numerous sites worldwide to assess the timing of the K-T boundary. By looking at locations where the fine-scale effects of the impact are recorded in the rocks, Keller was able to find evidence of the impact which dates the event to about 300,000 years before the K-T boundary. In addition, the reaction of fossils to this event showed that the effects of the impact have been grossly overestimated. Even within the foraminifera, aquatic protists abundant in the fossil record, not a single species went extinct following the Yucatan meteor impact. 3. 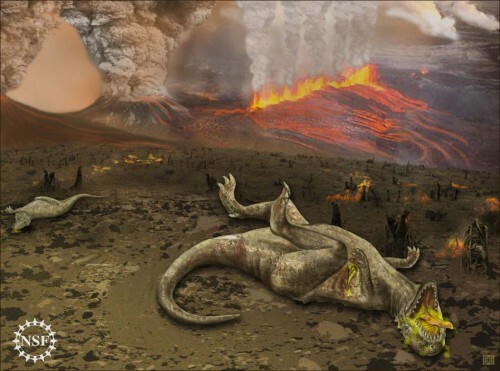 An artist’s interpretation of dinosaur extinction via Deccan Traps volcanism. Courtesy of Gerta Keller. The Deccan volcanism hypothesis seems to be a more putative explanation for the mass extinctions. This massive volcanic event consisted of three main stages, occurring about 67.4, 65.5, and 65 million years ago. Using 20 different locations in India, Keller was able to confirm that the second of these stages consisted of four to five mega lava flows which spread across 1500 kilometers of India and constituted about 80 percent of the total lava of the Deccan Traps. This was the most devastating of the pulses, occurring right at the K-T boundary. The first mega-eruption of this second phase was marked by a 50 percent reduction in species diversity while the end of this phase corresponds to the K-T mass extinction and the appearance of disaster opportunist species. Finally, the third phase of eruptions delayed recovery of species diversity until its end around 500,000 years after the K-T boundary. Dinosaurs and many other animal groups disappear from the fossil record immediately following this event, and Keller implicates the Deccan volcanism as the cause of this disappearance. This new evidence overturns a previously widely held belief and provides insight into the various causes of other mass extinctions. 4. 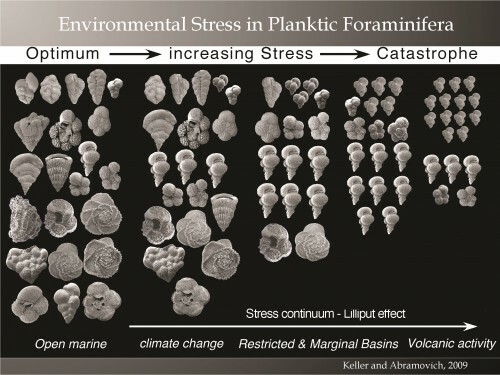 Following the volcanic activity around 66 million years ago, most of the foraminifera living on the planet were of the species on the right. This indicates a reaction to the high-stress conditions on the Earth caused by outgassing and lava flows from the volcanism. It is not until after the K-T boundary and the end of the volcanism that the species on the left return to prominence on Earth. Courtesy of Gerta Keller.